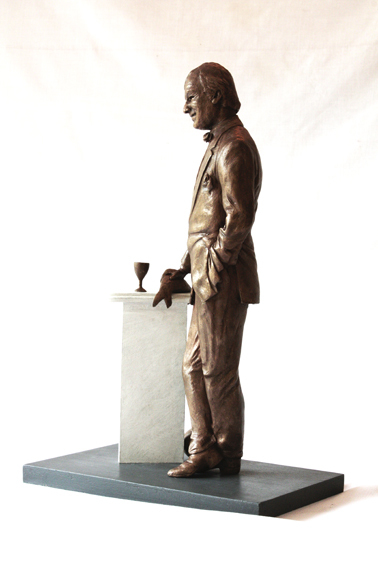 On the anniversary of Keith Floyd’s death last September, fund raising is under way for a memorial sculpture. The Keith Floyd Memorial Project has been set up by a group of local residents to facilitate the creation of a life size bronze and marble statue of Keith Floyd in the Somerset town of Wiveliscombe, where he spent his formative years. When Keith Floyd died on 14th September 2009 the nation lost a highly regarded, influential cook and television personality. Floyd’s trail-blazing example paved the way for many successful cook-presenters. The group feel that it would be a fitting gesture to recognise his achievements with a commemorative portrait sculpture. Keith and his family had a long association with Wiveliscombe. In his autobiography he fondly remembered his schooldays at the Primary School and later at Wellington School. As an adult he made many visits back to Wivey and in the 1970s he returned to live there with his son, who also attended the Primary School. Floyd referred to his time in Wiveliscombe ‘ as one of the most contented periods of his life’ He was the local boy made good, a celebrity son of the Parish. The estimated cost of the project is in the region of £90,000 and the intention is to raise the funds for the sculpture entirely from private sources. Support and donations have already been received from Raymond Blanc OBE, John Miles MBE, Jean-Christophe Novelli, David Pritchard, Phil Vickery and others. 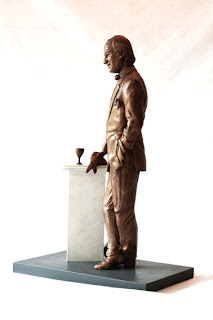 A limited edition maquette of the final piece has been produced for sale, the proceeds of which will go to the project. Contributions are welcome but must be accompanied by donor contact information for administrative and accountancy purposes. Issued on behalf of: Keith Floyd Memorial Project. High resolution photographs of the maquette available from John Alder.